Post-graduate study: your next chapter? Have you ever considered post-graduate study? Or maybe you’d like to find out more? 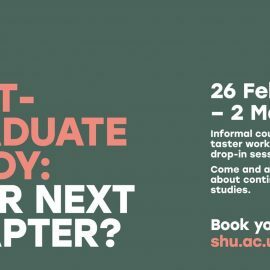 From the 26th of February to the 2nd of March Sheffield Hallam is running a series of events to help you get a better understanding of post-graduate study. Take a look at the timetable of events below to see what’s on. If you want to see what individual course talks will be running, take a look at our Postgraduate Study Week guide. You may have never thought about post-graduate study before. Here are three reasons you might want to consider it.